When Does Irritable Bowel Syndrome Start? Irritable Bowel Syndrome (IBS) is the most common intestinal problem that is referred to gastroenterologists. While IBS can materialize at any age, it most commonly starts in the years of early adulthood. The symptoms of IBS differ from person to person and run the gamut from mild to severe. The majority of people suffering from IBS have mild symptoms. A diagnosis of Irritable Bowel Syndrome is made when a person presents the symptoms of IBS for at least three days a month over a period of three months or longer. According to figures from the Center for Disease Control (CDC), IBS is diagnosed twice as often in the female population as it is in the male population and affects one of every six people in the United States. About 15% of the U.S. population has IBS at some point in their lives. Teenagers experience this first. There is 50% more ladies than men having IBS. IBS is normally associated with nervous tension. IBS can be painful, but it doesn't damage the bowel or cause cancer. However, long-term IBS could cause hemorrhoids or depression. Physicians agree that typically IBS occurs due to a neurological issue. Signals are sent between the brain and intestines. If you're under strain your brain fires either too few signals or too many to intestine muscles. The intestines move food either too quickly or too slow. That leads to constipation and bloating or painful cramps and diarrhea. IBS is linked to sleeping disorders, stress, and anxiety. The first thing individuals commonly do is to get over-the-counter medications for diarrhea or constipation. These medicines provide only short-term relief. It does not solve the problem. With IBS being linked to stress and anxiety, the professionals have a reason to suggest meds to control anxiety. There are people who become drug dependent on these drugs even after the IBS is gone. Taking too much of the drugs might cause negative effects on one's health, so make sure you are informed about the harmful ingredients in them. When taken as directed and following the advice in our eBook you'll see a noticeable improvement in just a few days. A small percentage of our customers do not respond to our product, for this case we offer 60 days full money back guarantee. Our promise is simple: If you don't see an improvement, return the empty bottle for a full refund! Manufacturing safe products is our #1 priority. 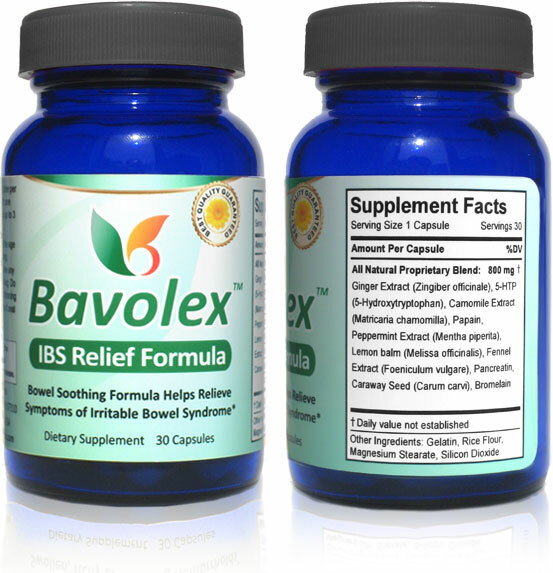 Bavolex™ contains natural extracts from plants and herbs that are considered safe. Our customers have been using Bavolex every day since 2009, and so far no adverse events (side effects) have been reported. As is the case with other supplements we recommend that you don't use Bavolex products if you are pregnant or nursing because the effects on fetus have not been tested. You should not take Bavolex if you are taking antidepressants or blood thinning medication. 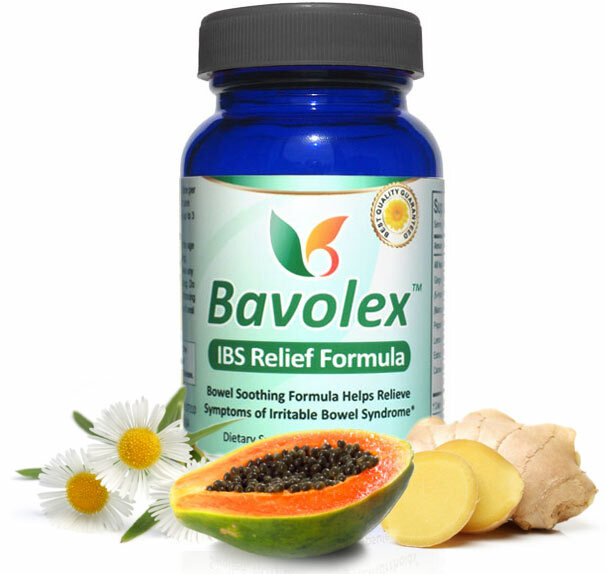 "Bavolex IBS Relief Formula is herbal supplement formulated with natural extracts and enzymes to help reduce Irritable Bowel Syndrome symptoms. 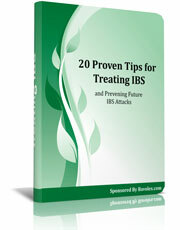 *"
In this eBook, you'll learn 20 useful tips to get rid of Irritable Bowel Syndrome attacks forever. These tips cover stress reduction, diet, and ways to prevent an IBS attack. This no-nonsense eBook is a lesson on simple lifestyle changes. A must-read for anyone who wants to stop Irritable Bowel Syndrome right now.